In these quick weekly posts we offer you bite-sized findings from our world-leading labour market research. Our labour market forecasts show that while demand for high skilled jobs are due to increase over the next decade, middle skilled jobs are set for a decline. The number of people employed in professional occupations and as managers, directors or senior officials is set to increase by nearly 20% between 2012 and 2022. In contrast, the numbers in middle skilled blue collar and administrative roles are predicted to decline. At the lower skills levels, overall demand will remain steady, as growth in the caring and leisure industries compensate for reductions in the need for machine, plant and process operatives. This is problematic for a number of reasons, not least because in this 'hourglass' economy it can be hard for those in lower skilled occupations to progress due to the falling numbers of roles that could act as their rungs up the ladder. These figures are based on our Working Futures 2012 to 2022 labour market projections report. Next month we will be publishing new forecasts based on updated figures. So you’ll be able to see whether these trends have continued and what others have emerged, soon! Did you enjoy this post? 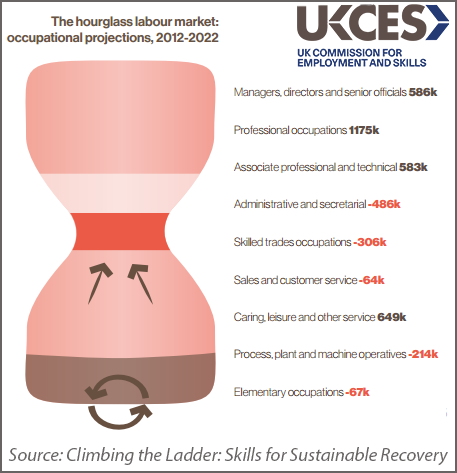 What do you think the hourglass labour market means for the UK economy? Comment below or tweet us @ukces.